The two commands File→Duplicate and File→Save As serve the same purpose and achieve the same result in OS X El Capitan. The difference is that you’ll find File→Duplicate in apps that support Versions and Auto Save, and File→Save As in apps that don’t. They’re different names for achieving the same result: Saving a file that’s already been saved with a different name. So you make all these changes in Letter to Kate, but you haven’t resaved this document yet — and although the document on your screen is actually a letter to Nancy, its filename is still Letter to Kate. Think of what would happen if you were to save it now without using the Save As feature: Letter to Kate reflects the changes that you just made. (The stuff in the letter meant for Kate is blown away, replaced by the stuff that you just wrote to Nancy.) Thus, the filename Letter to Kate is inaccurate. Even worse, you might no longer have a copy of the original letter you sent to Kate! The solution? Just use Save As or Duplicate to rename this file Letter to Nancy by choosing File→Save As or File→Duplicate. If you opt for Save As: A Save sheet appears, in which you can type a different filename in the Save As field. You can also navigate to another folder, if you like, and save the newly named version of the file there. Now you have two distinct files: Letter to Kate and Letter to Nancy. Both contain the stuff they should, but both started life from the same file. If you choose Duplicate: The title bar of the document becomes editable so you can change its name without even seeing a Save sheet. Press Return, and the renamed file will be saved in the same folder as the original. Or, if you want to save the newly renamed file in a different location, choose File→Move To or click the little triangle to the right of the document’s name, choose Move To in its pop-up menu, and then from the pop-up menu, select a folder in which to save the file. Now that you understand what Save As or Duplicate are all about, here’s an easier way to get the same result: Before you start, duplicate the document in the Finder (choose File→Duplicate or press COmmand+D). Rename the copy and open it. This way, when you’re done making changes, you don’t have to remember to choose Save As; you can just perform your habitual Save. This approach also protects you from accidentally saving part of the letter to Nancy without changing the file’s name first (which you’re likely to do if you’re following my advice about saving often). So when you decide that you’re going to reuse a document, choose Save As (or duplicate and rename the file) before you begin working on it, just to be safe. For those who prefer to use Save As, just press the Option key before you click the File menu and Duplicate magically transmogrifies into Save As. Sweet! Versions gives you the benefits of Save As without any action on your part, but many programs still lack support for Auto Save and Versions as of this writing. And, in fact, some Apple apps, as well as most third-party apps, still use the Save As technique. Some of Apple’s offerings (most notably TextEdit and the iWork apps) use Auto Save and Versions. One last thing: If the app you’re using supports Versions, it creates a snapshot called a Version automatically as you work, when you pause, every five minutes, and every time you choose File→Save (Command+S). Choose File→Revert To→Browse All Versions or click the Time Machine icon in the Dock while the document is active onscreen. 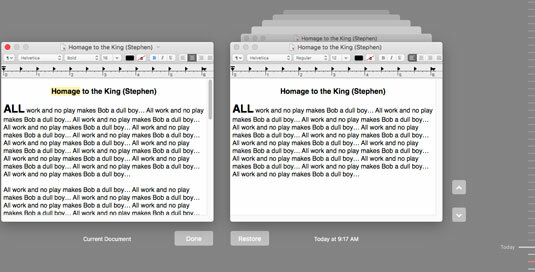 Either way, Time Machine displays versions of the document side-by-side, as shown here. Browse All Versions lets you compare all versions and revert to an earlier version. Just so you know, this figure is the Time Machine backup utility displaying the various Versions. The Tab key is useful for navigating the Save or Save As sheet.